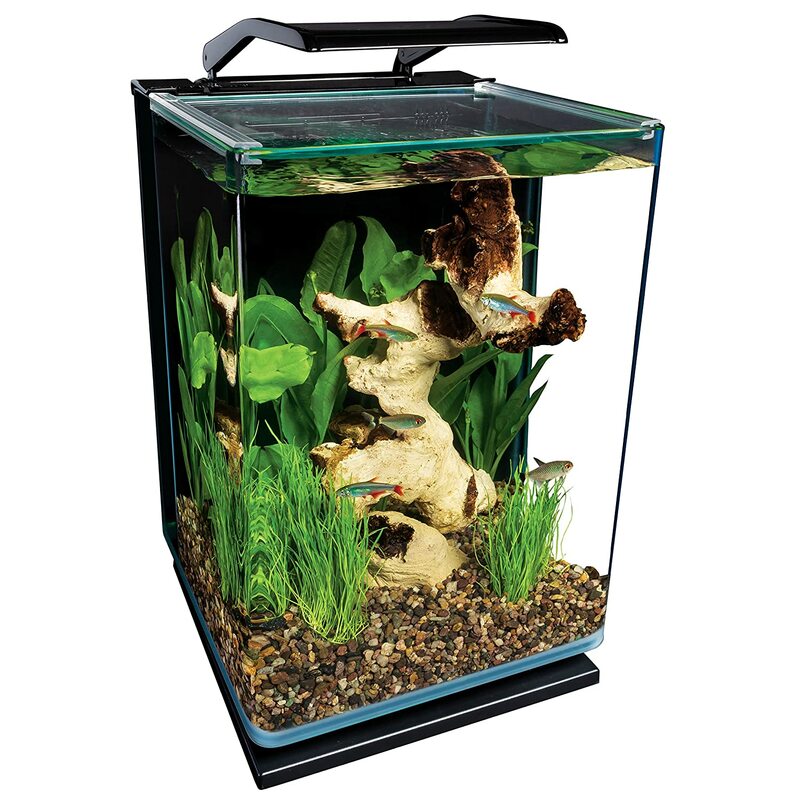 To keep your fish in the best looking and most practical place, you are going to want to find the best betta tank available. You want a tank that has room for plenty of fish, without taking up too much room. It is also important that the filter does not become too distracting. We have compiled a list of what we believe are the best value as well as the most aesthetically pleasing for you to choose from. Here we have one of the best betta tanks going and it is pleasing on the eye. One of the features that set this apart from some of the others is the fact that the LED light has two settings. These are white and blue moonlight which can really illuminate a room and change the mood accordingly. It is 9.625 x 9.625 x 17.2 inches. It holds 5 gallons which gives you plenty of room for an exciting selection of fish. It is a portrait style design which fits nicely on the side of your at home unit without taking up too much space. The filter is very discreet which is something we often look out for, no burring sounds for us please! This is because it is an advanced 3 stage hidden back panel with a pump you can adjust to fit your needs. The sliding glass canopy even gives you an easy way of accessing the tank. There is a lot to like about this one. 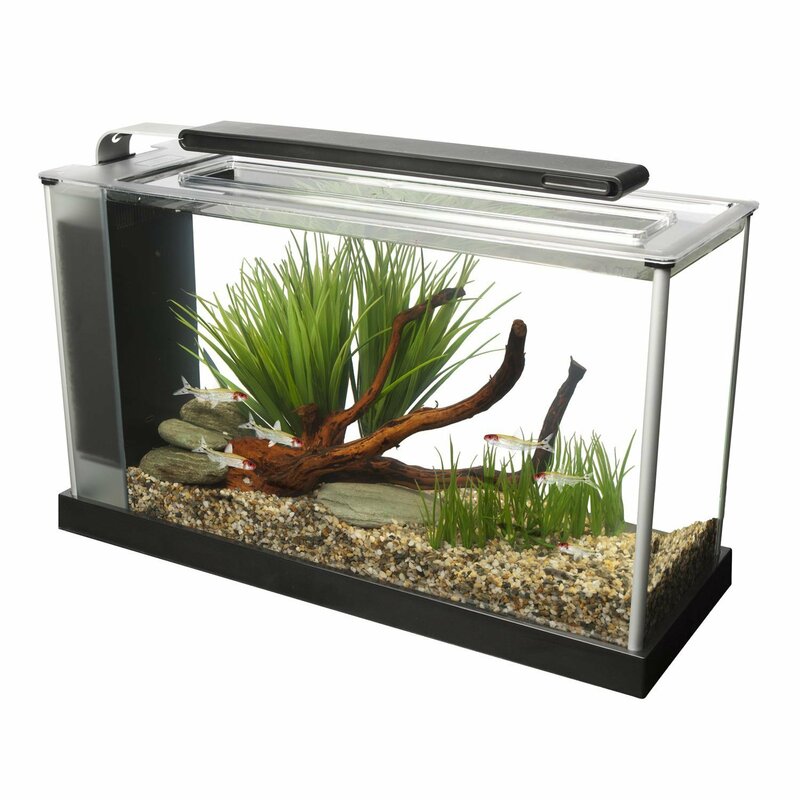 This smart looking acquaium is an excellent choice for ahyone looking for a 5 gallon that will sit nicely on any worktop. It's size is 17.2 x 10.6 x 6.3 inches. It is made from etched glass with an alumininmium trim and is packed by a powerful LED system - a 37 LED lighting system infact. These are great for growing numerous plants and is something you wont always get with other choices. The filter is sizeable and the power it can exude reflects this. Certainly an eye catching addition to any home it is also very portable if you might need to move it at any time. 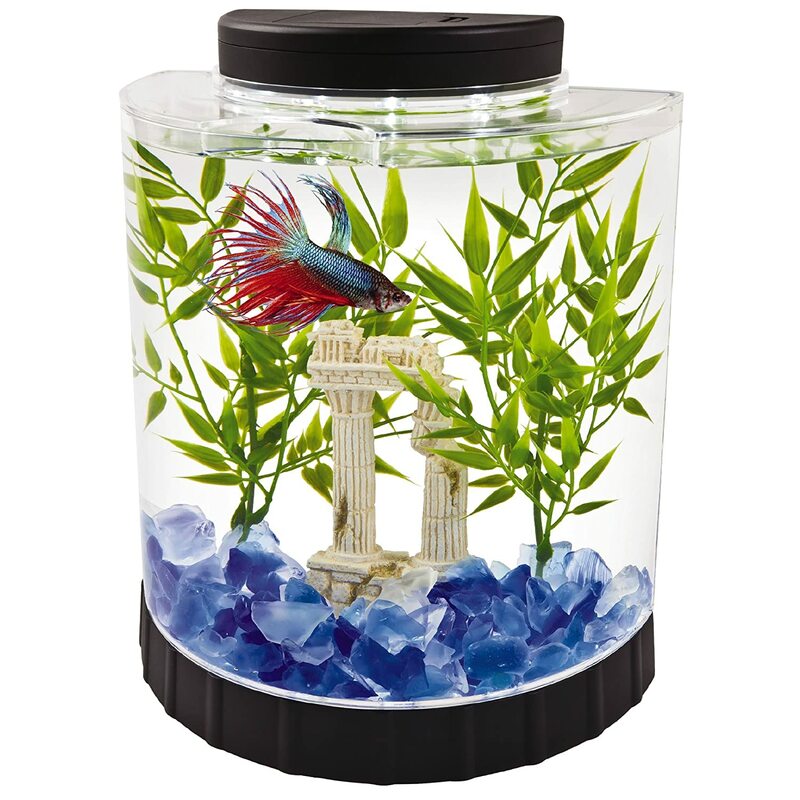 This small but effective betta tank might only be 2.6 in size but it stylish and funcitons perfectly. As you would expect this is compact and makes a convenient tank for anyone looking for something that isn't going to take over the room, but compliment it instead. 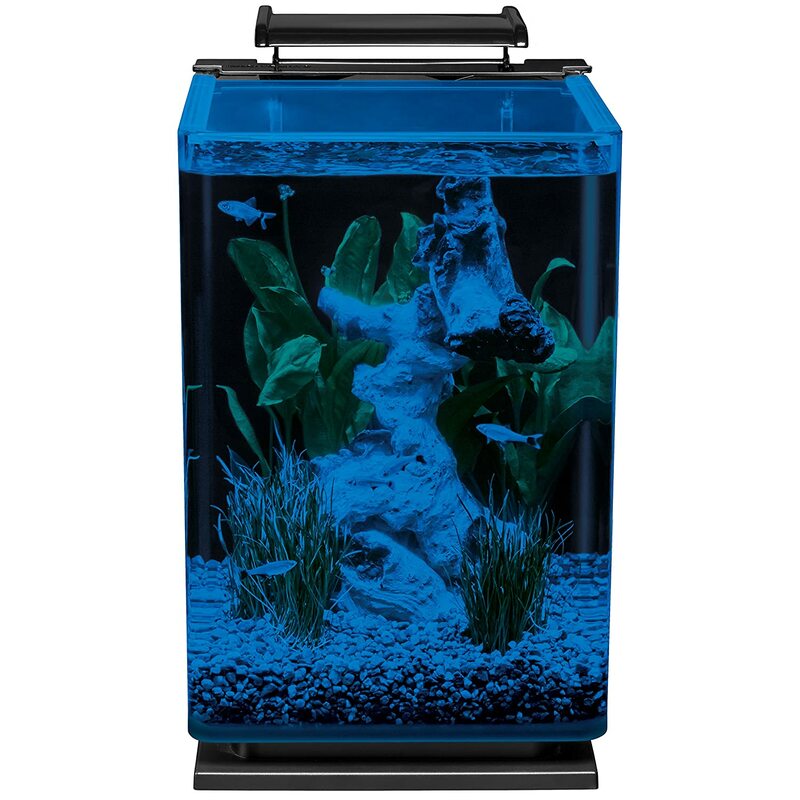 Sleek in design, the LED system matches this description too as it hangs over the tank illuminating your fish. There are 31 LEDs that are more powerful than you would think for a small tank such as this. 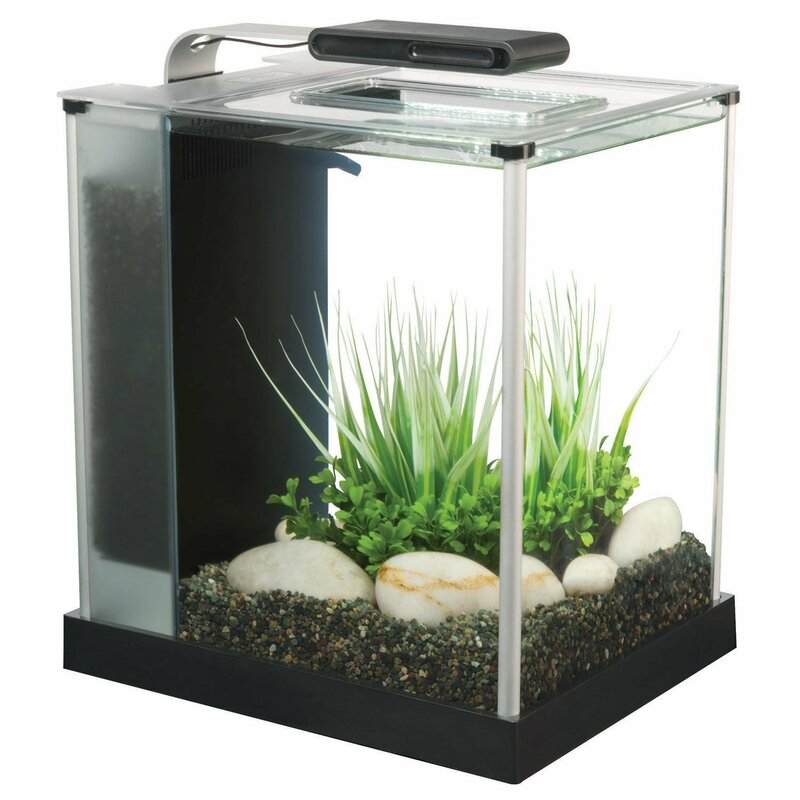 It has everything you need including a neat 3 stage filtration system and acrylic top. Ther are 4 pegs that are mouded to the lid to stop it from sliging around and keeping everything in place. You will be suprised at how many tanks fail to provide this. The pump in particular is very quiet you barely notice it is there in terms of sound and there are various heater options. It comes in at a small but mighty 10.8 x 9 x 11.9 inch dimension. The specs of this are 4.875 x 9.5 x 9.9 inches. It is a smart half moon design that really makes it stand out on any workspace and has many unique features. The LED light can be moved to be above or below the tank which is a great feature and can really change the ambiance to your room. It is 1.1 gallon so it really is compact. The LED light takes 3 x AAA batteries or even a micro USB cable which is a good feature as it means it can be moved around easily thanks to it's cordless design. It is probably one of the easiest tanks to clean. 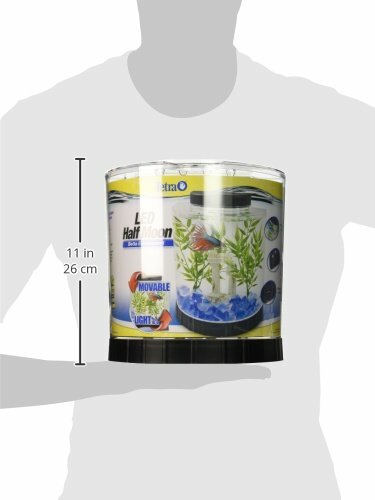 The lights are very easy on the fish which is a good feature and the feeding hole is part of the lid at the front which makes it easy to feed your fish. A quality product that is as good looking as it is compact. For us, the best betta tank was the MarineLand Portrait Aquarium. 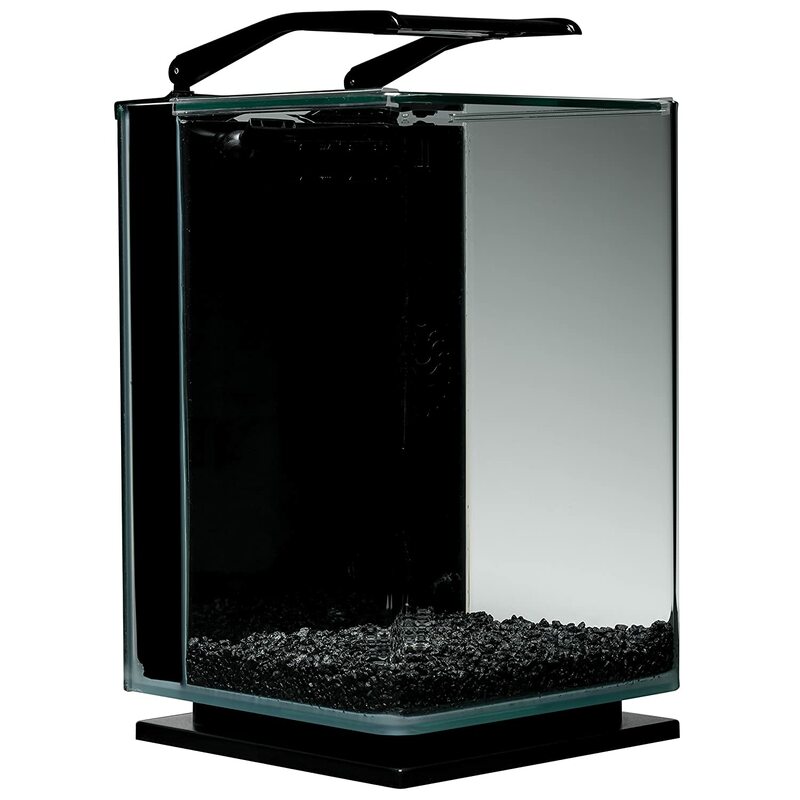 It one of the nicest designs and has a roomy 5 gallon space that will accommodate a good amount of fish. We like silent filter and it is one for the things you really notice (or don't notice!) about this betta tank. A compact option, but one that can still hold a good array of sigh and plant life that keeps having fish fun. It looks even better because of the hidden cords, nothing is seen that you wouldn't not want on display and what really did it for us was the LED light. This is because of the two settings it has that can really chance the mood of the room. The white LED gave a shimmering effect on the water and the blue option gave a moonlight glow that is very relaxing. This is particularly nice at nighttime. All in all, it is a great option for any home. It's pleasing on the eye and functional as one. One of the highest performing betta tanks we have seen.